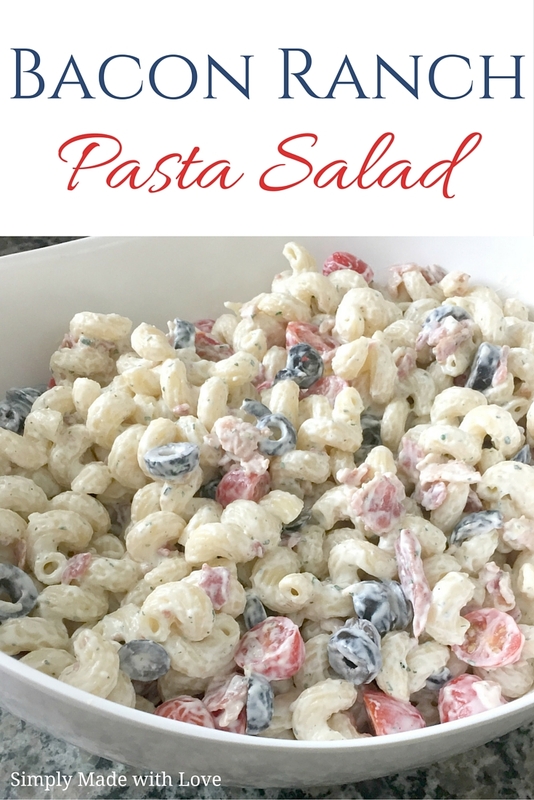 Pasta salad is a spring and summertime staple in our house. It's easy to make. There are endless varieties and it's a crowd pleaser. I first made this particular pasta salad recipe last year. It was for a summer BBQ birthday celebration. My brother was bring meat he smoked in his new smoker and I was in charge of the sides. Of course, I waited until the last minute to figure out what I was making and ended up going into my pantry to see what I could come up with. After finding a packet of ranch dressing mix, I knew exactly what I would make. If you've been following this blog for a while, you know I'm all about quick and easy recipes. I can't begin to tell you how easy this is to make. My entire family raved over it and my future SIL asked for the recipe the next day. This creamy flavorful pasta is perfect for tailgates, summer BBQ's and so much more. Enjoy! 1. Boil pasta until cooked (8-10 minutes) and drain. 2. Cool pasta off by rinsing it with cold water. 3. In a large bowl, mix together sour cream, mayonnaise, milk and ranch mix. 4. Once above ingredients are completely mixed, add in cooked pasta. mix until the pasta is covered with ranch mixture. 5. Add olives, bacon and tomatoes to the pasta mixture. Mix lightly until all ingredients are combined. 6. Chill for 1-2 hours before serving. Visit Leah H.'s profile on Pinterest.